If your house is like mine, you probably have more than one mobile device. Whether it’s multiple phones, iPads, a laptop, or what-have-you, the AUKEY 54W 5-port USB charger is a great buy if outlet space is at a premium in your home. 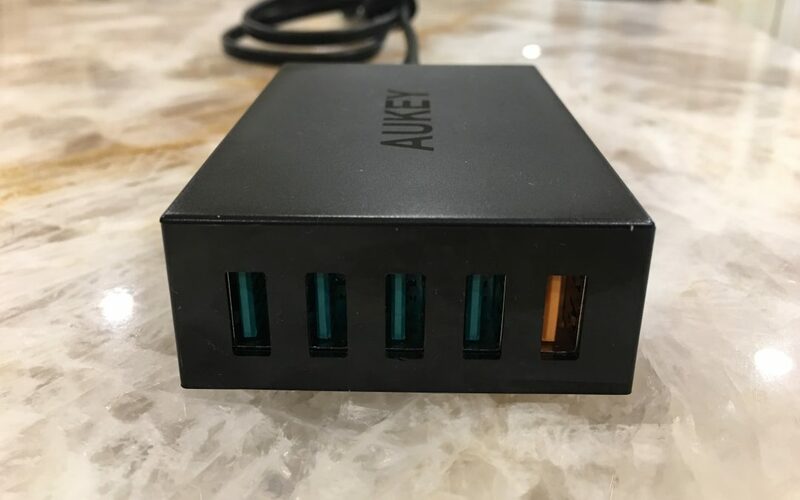 The AUKEY Block allows for five devices to be charged simultaneously, which is extremely helpful come the end of the day, when the whole family needs to power up. The block emits the standard 5 volts that your devices need, and at 2 amps max per port, it’ll charge your iPad quickly too. The Bonus: This charging block comes with an orange-colored Qualcomm 2.0 Quick Charging port. With a quick charging port like this one, your phone will charge 3x-4x faster than usual. For those of you who own a Samsung, HTC, or other Android phones, your phone’s battery will fully charge in mere minutes. Before using, be sure to check your phone’s user manual to confirm that your device is Quick Charge compatible.